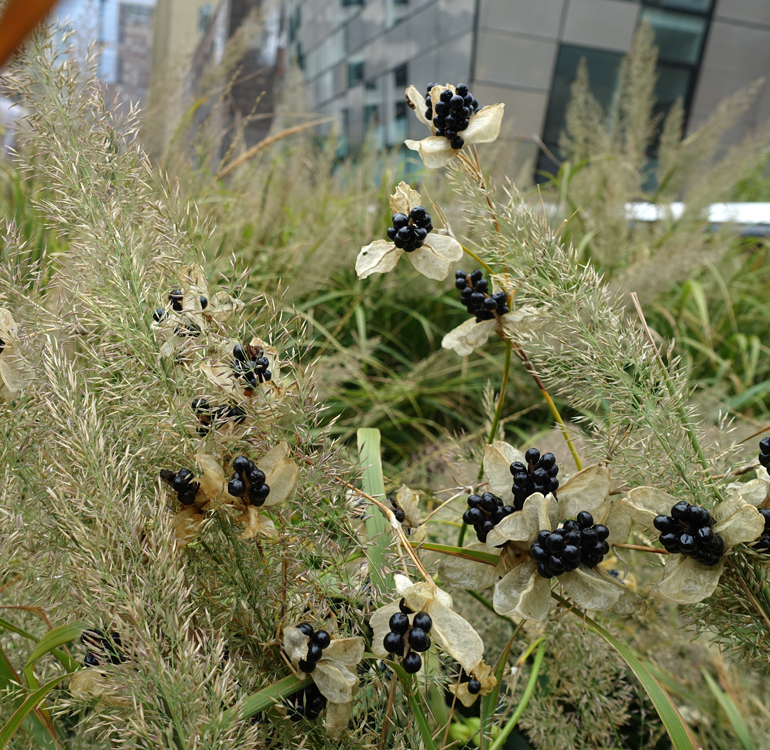 As temperatures drop, High Line plants with particularly attractive seedheads draw our attention, from Hibiscus moscheutos to Penstemon digitalis ‘Husker Red.’ This week the Blackberry lily, though set amongst the showy Calamagrostis in the Meadow Walk, is far from outshined – its glossy, blackberry-like seedheads create a handsome focal point for the eye, as did its vivid orange blooms in late summer. The Blackberry lily, Iris domestica, was chosen for its shape, color, and multi-seasonal interest. The Blackberry lily was introduced from Asia and naturalized fairly quickly, as evidenced by botanists’ notes of the 19th century suggesting that the plant was native to the American southeast. Known as Belamcanda chinesis for most of its recorded history, closer studies of its genetics resulted in its reassignment to the Lily family and its being renamed to Iris domestica, as it’s now known. Its leaves are the classic spear shape that identifies a monocot, in an elegant fan shape, not unlike those of a gladiolus; the flowers are typically orange with red spots, and live for a single day, while the plant as a whole blooms for several weeks. After the bloom dies, it twists itself into a multicolor spiral that provides visual interest of its own. 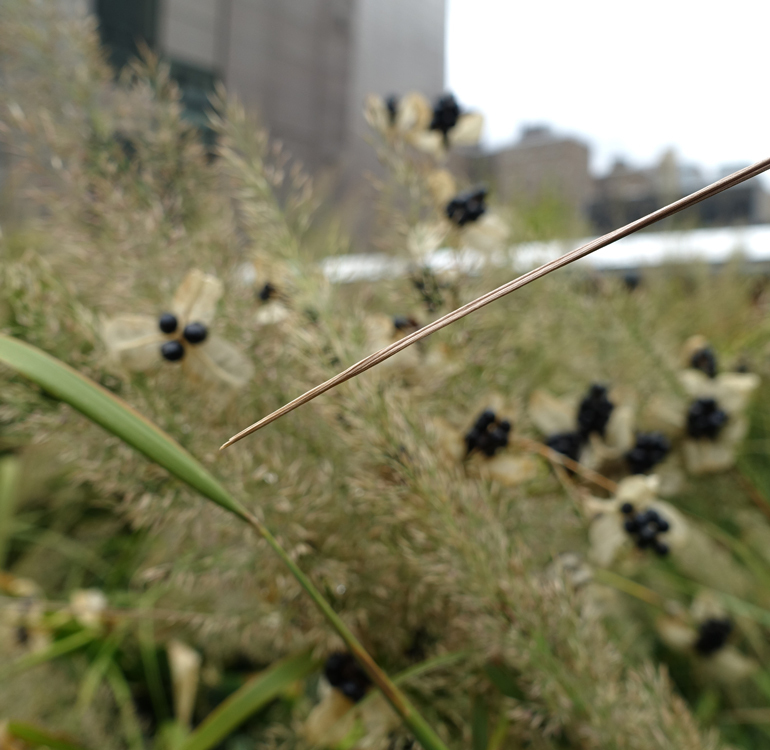 In early fall, flowers give way to a bulbous pod which fades from green to dusty tan and finally splits open to reveal a beautiful, berry-like seedhead. This iris prefers full sun, which it receives in the Meadow Walk, and moderately fertile soil. Be warned that while deer avoid this plant as they do many irises, slugs are huge fans; it might be wise to place a can of beer nearby to distract these slippery folks if much damage occurs, particularly in the spring. In terms of human consumption, Iris domestica has long been used medicinally to fight viral infection and reduce inflammation, but should only be administered by professionals, as seeds and other parts of the plant can be poisonous. While it’s commonly recommended that Iris domestica be used in border plantings, it’s clear that this plant can command just as much attention in larger areas as well. Calamagrostis and other similarly mounding grasses provide it with excellent structural support that keeps it upright, and it in turn can hold its own amongst aggressive spreaders, as it seeds just as aggressively. As the seedheads are one of the more charming qualities of this plant, and provide beautiful winter interest, it might be preferable to remove unwanted self-seeded plants in the spring rather than removing seedheads in the fall. Can tolerate full sun or partial shade. Plant in early autumn for blooms the following year, but beware poorly draining soils, which can cause plant death in a freeze. Deadheading will prolong blooming. Grows taller with more moisture and richer soil. Meadow Walk, between 23rd and 25th Sts.